Buying Bitcoin with a credit card is one of the most convenient and popular ways to purchase the digital coin. This option is available on many cryptocurrency exchanges. Two possible restrictions you will need to be aware of are regional (most exchanges will only accept credit cards from certain regions) and funding limits (most exchanges have a daily funding limit for Bitcoin purchases using a credit card). Beyond that, buying BTC on credit is quite straightforward. In this short guide, we will compare some of the best options you have to acquire Bitcoins using your credit card and direct you to where you can find more detailed answers to specific questions. Jubiter is a newer cryptocurrency exchange and storage solution that allows you to acquire Bitcoin and other cryptos in an extraordinarily fast and user-friendly way. According to their website, Jubiter’s vision is “to help transform Bitcoin and other digital assets into viable, universal, international currencies”. Jubiter accepts Mastercard and Visa credit and debit cards and only requires a minimum amount of personal information. Once your account is verified, (which occurs instantly), you can purchase Bitcoins by following these steps and uploading these required documents. 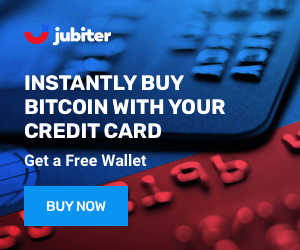 Jubiter charges a 4.9% processing fee and allows users to purchase anywhere from a minimum of $50 up to a monthly maximum of $20,000 worth of Bitcoin. Jubiter is fully licensed in Estonia to provide crypto to fiat exchanges and to provide a custodial cryptocurrency wallet service. Jubiter’s services are available in many countries around the world with a relatively short list of exceptions. The see the list of unsupported countries, you can visit here. 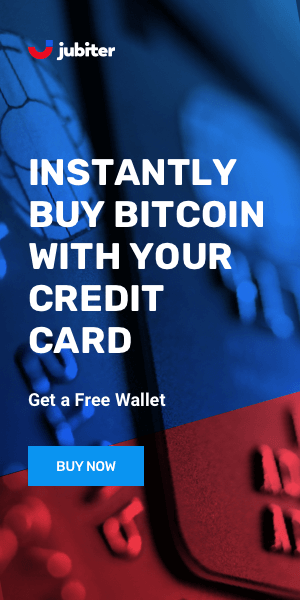 CEX is another great option for purchasing Bitcoins using a credit card. It is known as a solid cryptocurrency exchange with over two million active users around the world. CEX is registered in the United Kingdom, has a Money Services Bussiness status in FinCEN, and has been operating since 2013. CEX will accept credit card payments including VISA and MasterCard, as well as other methods like SWIFT and SEPA bank transfers, and other cryptocurrencies like BCH and ETH. You can check out CEX’s guides on how to buy Bitcoin, how to verify your identity, as well as how to buy with your credit card on their platform. CEX offers variable rates on Bitcoin purchases. A downside is the daily buying limit of 300 Euros. Its services are also only available in the US, Europe, and South America. Coinbase is one of the world’s most well-known cryptocurrency exchanges. Operating since 2012, it is recognized as one of the most convenient ways to purchase Bitcoins. Coinbase allows you to buy up to $150 worth of Bitcoin every week using your debit or credit card if you are a resident of Canada, Australia, Europe, the UK, or the US. All purchases made on Coinbase via credit and debit card are charged with a flat 3.99% fee. For a complete step by step guide on how to acquire Bitcoin on Coinbase, you can read here. If you have further inquiries, Coinbase has a substantial support page that can help you navigate the platform. If you’re looking to buy in large quantities, you may want to check out Israel-based Coinmama. It is one of the specialized options for purchasing larger quantities of Bitcoins using your credit card. Although you have to have your own separate wallet when you buy crypto at Coinmama, the platform offers some of the highest purchasing limits available on the market. Using this exchange, you can acquire a max of up to $5,000 daily, and up to $20,000 a month. Coinmama’s fees are around 10% for credit card purchases, which are a little higher than other competitors. Coinmama's promise is to make it up with speed: purchases made using this platform are instantaneously processed. If you want to check out Coinmama’s complete FAQ section, you can check it out here. Before going ahead and buying Bitcoins with your credit card, you may want to check out a couple of our guides. We have good advice on how to pick an exchange and how to choose a wallet in which to store your new Bitcoins.